LIVE inside The Charles Hayden Planetarium, with visuals created specifically for the performance. Only 200 seats available! This experience will NOT be repeated! 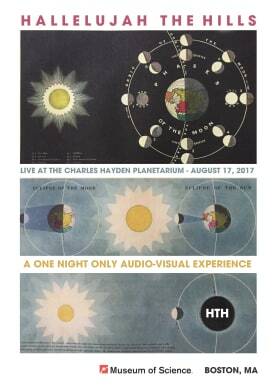 Join Hallelujah The Hills as they perform ten songs from their decade plus exploration of inner and outer universes underneath the stunning dome-screen at the Charles Hayden Planetarium. HTH and Museum of Science animators are working together to tailor a visual journey that will take the audience through the most unique presentation of these songs ever performed. For this show only, the band will expand to a ten piece unit including a choir and strings. Whether you've seen the band dozens of times, once, or never: THIS is the show to make sure not to miss.